Wow, you have quite a wonderful blog here....I'm always looking for things for our church small group potlucks. I will visit again! And I plan on heading to the post office. I can think of several friends that might like those stamps in a frame! I am going to have to try this. It sounds delicious. I will have plenty of zucchini soon. :) Thanks so much for sharing! Anita, thank you; I think you'll find lots of things on my blog that you can take to potlucks. Enjoy the songbird stamps! That does sound very tasty, Jean. I didn't plant zucchini this year because it goes from'not quite ready' to 'past the edible stage' in about 5 minutes. Lol. I should have planted 1 or 2 seeds. Would have been plenty. Now I'll have to stop in at the farmers' market and pick up one for this recipe. Judy, I hope you like it! Yep, you really have to pay attention - you can practically *see* the zucchini getting bigger by the minute! We eat lots of zucchini (and peaches) these days...mine are all from the supermarkets though. Your salad looks super, Jean. We are growing zucchini for the first time this year. We've already made 4 loaves of bread. I hear there is a mountain of zucchini currently piled on my counter. Time to start passing them out! This looks delicious, Jean! I love a salad with an Asian flair! Nicole, thanks! Have a great weekend, too! Angie, thanks. Next year I'll expand my garden, but this year I'm buying most everything. Christine, let me know how well the salad spinner works. It seems too good to be true! Thanks so much, Cheryl! I hope you'll try it soon. Melissa, thanks! Hope you like it. I really like a nice not-too-sweet zucchini bread - I should post that, too. Thanks, Jacqueline. That does sound like a good combination! :D No, Sully, I don't make a zucchini pie! But I DO make wonderful zucchini breads and cakes, even a chocolate one! You would love the chocolate one. I would love this. Thanks so much for the recipe. Hope you have a lovely weekend. Thanks, Mildred! Hope you'll try it soon. Thanks for stopping by my blog and the comments. Nice to find your site. This salad sounds good, and I'm saving this one for when I've got an army of zucchini rolling around on the counters. 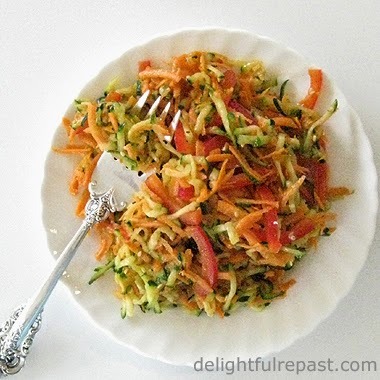 Zesty zucchini salad sounds so good right now! This summer I want to try baking with zucchini. Yum, Yum, Yum Jean! Just the right sounding ingredients! I didn't plant any zucchini this year either--drought conditions. But I will purchase some and make this! Bianca, you will love baking with zucchini, that most versatile vegetable! Sue, thank you so much! You are always so encouraging. Hope it doesn't disappoint! Hi Jean! Thank you for your visit and nice comment! I hope you're having a great summer! I love zuccini in salads. This recipe looks delicious! I love a nice zuccini bread too! Jacqueline, thanks! I had zucchini bread yesterday. Put some carrots in it this time, too, since I had them on hand. Just made this over the weekend and WOW! Love it. Thanks for sharing it Jean! Thanks, Danielle! So glad you liked it. I'm making it again today. Thanks so much, Diane! Hope you're having a great summer! I can't wait to give this a try ... just harvested a few big zucchini from my home garden! Cool, Bren! Hope you like it. Happy gardening! This sounds so delicious! We are growing zucchini in our garden, so I'll have to try this once we harvest it! I hope you "two birds" will try it and like it as much as we do! I didn't plant any zucchini this year -- knew I wouldn't be able to keep up with it! Love seeing ideas for new salads and zucchini is certainly in easy supply! Thanks, Pauline! And, FYI, I just finished your wonderful novel Saving Saffron Sweeting. 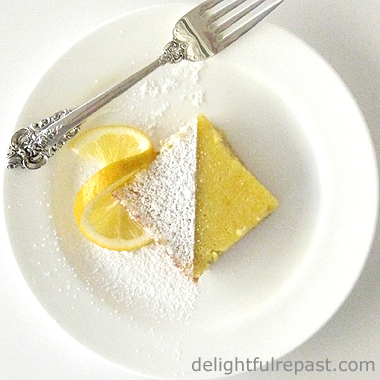 I liked it so much I created a new category in my Delightful Repast Kitchen Store (the link is in the right column or sidebar or whatever you call it). The new category is called Just For Fun! Jean, what a lovely compliment, thank you so much. I'm off to check out your store now.